MENLO PARK, Calif., Jan. 24, 2019 /PRNewswire/ -- Employee absenteeism after major sports events like the Super Bowl is on the rise, suggests new research from staffing firm OfficeTeam. More than half of professionals (54 percent) know someone who's called in sick or made an excuse for skipping work following a big game. That's up from 41 percent three years ago. In a separate survey, senior managers identified playing hooky the day after (42 percent) as the most distracting or annoying employee behavior when it comes to sports, a 20-point jump from a similar survey in 2017. 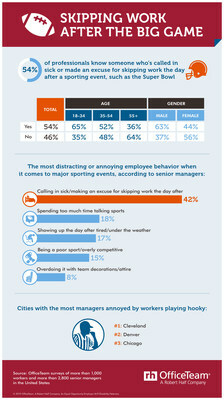 View an infographic about sporting events and work. Professionals ages 18 to 34 (65 percent) most often said they know someone who's played hooky following a major sports event, compared to those ages 35 to 54 (52 percent) and 55 and older (36 percent). Sixty-three percent of male employees admitted the same, versus 44 percent of women. Among the 28 U.S. cities surveyed, the most senior managers in Cleveland (56 percent), Denver (52 percent) and Chicago (51 percent) were annoyed by staff missing work the day after a big game. "It's easy to get drawn into the excitement of major sports events," said Stephanie Naznitsky, executive director of OfficeTeam. "Employees can do their part to keep it business as usual by giving advance notice if they want to take a day off, keeping game discussions to a minimum, and following company guidelines for things like breaks and fan gear." Naznitsky added, "Managers may cut their workers some slack leading up to and after a popular event by offering schedule flexibility or organizing group activities to celebrate. It's also a good idea to contact a staffing firm to help cover employee absences." The online surveys were developed by OfficeTeam and conducted by independent research firms. They include responses from more than 1,000 U.S. workers 18 years of age or older and employed in office environments and more than 2,800 senior managers at companies with 20 or more employees in 28 major U.S. cities. OfficeTeam, a Robert Half company, is the nation's leading staffing service specializing in the temporary placement of highly skilled office and administrative support professionals. The company has 300 locations worldwide. For additional information, visit roberthalf.com/officeteam. Follow roberthalf.com/officeteam/blog for career and management advice.